Call center jobs can be either work at home (a.k.a. virtual call center) or in an office outside the home. Companies may hire call center agents for their business needs, or they may contract with business process outsourcing firms (BPOs) who provide call center services to other businesses for a fee. Many of the available home-based call center positions are for such business process outsourcing firms. Positions may be service, sales, or technically oriented. This list of call center jobs concentrates on those that are work-from-home opportunities for people who live in Florida. Florida offers a lot of work at home call center opportunities, in comparison to many other states. This list is by no means definitive, but these home call center companies hire for work at home jobs in Florida, as well as other states. If you are interested, you should research each company's specific requirements for employment. This BPO firm hires independent contractors as tech support and customer service agents. Compensation is discussed on the application and is paid weekly. The company employs telecommuting customer service reps in Florida and across the country. They are paid on a per-minute or per-call basis, but because they are employees, the minimum wage in their states is guaranteed (employees are paid the higher of the two rates). You will be paid for training. Applicants pay for their background check. Home-based jobs at this online retailer are mostly seasonal, but there are some permanent positions available in its virtual call center division. If you want to work for Amazon in a virtual position, you must live in one of its 26 eligible states (as of 2017), including Florida. Pay is discussed on the application, and you will be paid for training. This airline has remote positions for reservation agents who live within 75 miles of the Miami International Airport. The schedule will most likely include some weekend days, holidays, day and evening shifts. You must be able to attend a 9-week training class in Miami prior to employment. These are full-time positions. Starting pay is hourly and is discussed on application. After six months of excellent performance, the rate may be raised. Apple At Home is a virtual call center program that hires on a part-time or full-time basis. They will train you, and you will receive a robust benefits package. They will supply you with an iMac and headset. Ongoing coaching and training are available. This division of this global financial giant hires telecommuting call center agents for its Virtual Customer Care Professionals program. Agents handle cardholders' inquiries. Bilingualism is a plus. The company hires nationwide for full and part-time work-at-home jobs in customer service, premium auditors, sales and b2b marketing/telesales reps. ARO is a contact center for some of the nation's leading corporations. Employees of ARO can both train and work from the comfort of their homes. The current client needs to determine which states and geographic locations from which ARO is hiring. If they are not hiring from your area when you apply, they will keep your information on file and contact you when they have something available in your area. For more companies like this, see more work-at-home insurance jobs and sales jobs from home. Asurion offers customer service based work from home positions in inbound customer service, generally assisting customers regarding wireless handset insurance claims, electronics repair facilitation or roadside assistance requests. CenturyLink is a provider of voice, broadband and video services for consumers and businesses in 33 states. Work at home call center jobs are in tech support and virtual sales. Bilingual encouraged to apply. Virtual call center agents receive incoming calls and provide services that may include customer service, sales or technical support. Convergys offers paid training and benefits. Schedules with 16 to 40 hours per week are available. Worldwide hotel chain's Hilton@Home program hires work-from-home sales agents for customer care and reservations. New hires receive in-depth brand and technical training and support. Bilingual in Spanish, or Portuguese can earn you more per hour in some positions. Some positions qualify for an incentive program. Reservation agents are training virtually. The Home Shopping Network (HSN) offers work at home jobs in call centers. Inbound calls are both sales and customer service. Full-time positions provide health insurance benefits. Jobs are based in St. Petersburg, Florida. Pay is discussed on application. The company hires independent contractors agents, including licensed insurance agents, for a variety of call center jobs for its clients including inbound sales, outbound sales, insurance claims, roadside assistance, healthcare and customer service. Agents are paid at a rate that is based on minutes of talk time plus sales incentives in some cases. Agents must become "certified," part of which is a background check, which the applicant pays for. Sitel Work@Home, the company's work-at-home division, offers U.S.-based call center agents full- and part-time jobs with training from home. 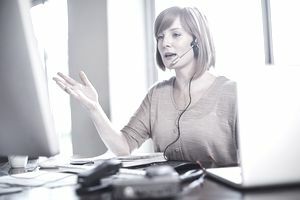 Calls may involve billing inquiries, account or product inquiries, product or service orders, installation scheduling or technical product troubleshooting. Agents are employees and benefits are offered. Remote agents receive customer service, and sales calls for a variety of clients, earning an hourly rate with benefits and, at times, performance incentives. There is paid training too. Applicants pay for a background check. Global business process outsourcing (BPO) company hires associates In some U.S. states and the U.K. to work from home as call agents and other fields. Bilingual call center agents are needed. You must have a PC and headset, per their specifications. This global call center outsourcing firm (BPO) employs home-based customer service and tech support agents in Florida and throughout North America. They offer a competitive salary, benefits, and incentives. Agents in these work-at-home call center jobs provide customer service, make reservations and provide roadside assistance. Jobs may be seasonal, but they are employment positions. You must have a PC, headset, and reliable internet connection. Founded in 1976, Ver-a-Fast provides subscription verification services for newspapers as well as providing telemarketing services to other industries. Work at home call center agents make verification calls. The company hires inbound and outbound call center agents (English-only and bilingual in Spanish) for work at home jobs. Pay ranges from $8-$13/hour. There may be more companies that hire agents from Florida on this list of call center companies that hire agents from Florida.